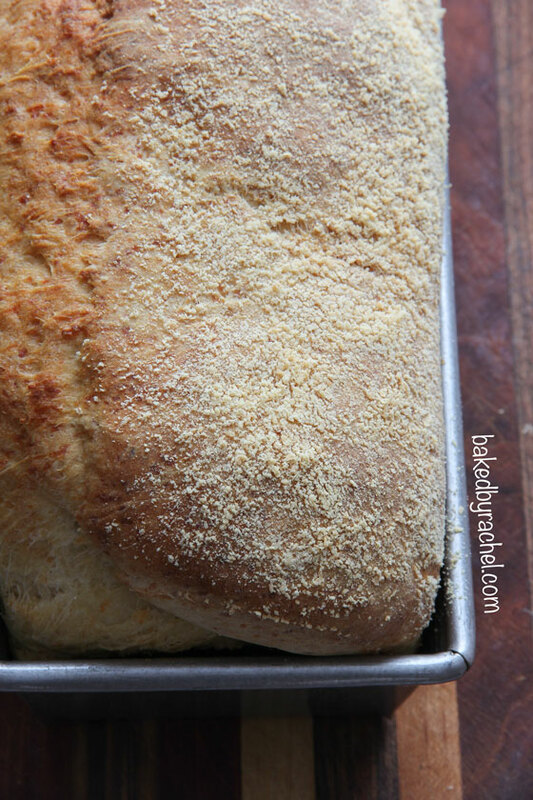 A tender and flavorful loaf of potato bread with Parmesan cheese throughout. I’ll be honest. All I want to do right now is complain about the weather and how I’m totally over winter. I’m totally calling wolf on this storm too. They’ve been saying it’s a major storm from the beginning … a bad one with heavy wet snow and wind and blah blah blah. The predictions have gone up and down. I’m just over the inaccuracy that has been this winter. But we’ve been through this already. Spring is pretty and warm and pleasant and winter is not. 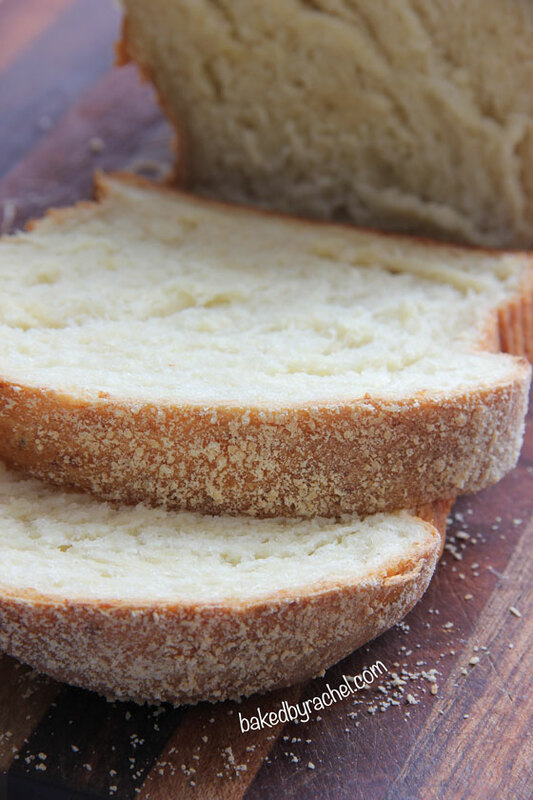 I may seriously need to make another loaf of this delicious bread to get me through both the blizzard bag day assignments (I’m not a first grade teacher) and more snow. When I first made it, it was seriously devoured. I’m a carboholic and proud of it. Bread is delicious and this one especially so. It’s similar to these truly fluffy and tender Amish potato rolls, perfect for dinner, but this is in sliceable loaf form with a nice crust and Parmesan coating. Mmm mmm. Seriously, does it get any better? Yep… you definitely need this loaf in your life asap! And slather a slice with butter while you’re at it, because that’s what you do with bread. Bread… and butter. Heat milk to 115°F. Dissolve yeast and 1 tsp sugar in warm milk. Allow yeast to proof. To the bowl of a stand mixer add mashed potatoes, 3 cups flour, remaining 1 Tbsp sugar, salt, eggs and 1/2 cup Parmesan cheese. With mixer running on low, slowly add yeast mixture. 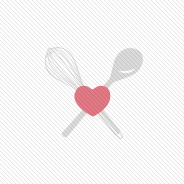 Mix until dough comes together into a ball and pulls away from the sides of the bowl. If dough is still excessively sticky, add 1 Tbsp of flour at a time until dough is no longer sticky. Transfer dough to a lightly oiled bowl. Cover and allow to double in size, roughly 1 hour. Preheat oven to 350°F. Lightly grease an 8-inch loaf pan. On a lightly floured surface, roll out dough into a 14x7-inch rectangle. Starting at one of the short edges, roll up dough tightly, pinches the edges to seal along the way. Place rolled dough in prepared loaf pan. Sprinkle with remaining 1 1/2 Tbsp Parmesan cheese. Allow to rise for an additional 30 minutes, loosely covered in a warm location. Bake for 30 minutes or until golden and center reaches nearly 180°F. Allow loaf to cool prior to slicing. 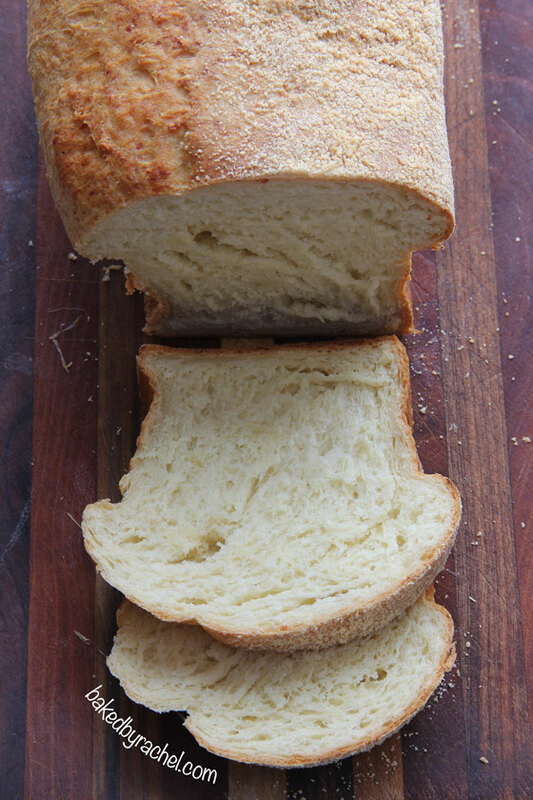 Store bread in an airtight container. Recipe yields 1: 8-inch loaf. This looks absolutely unbelievable and now that I have a stand mixer, I’m dying for a reason to use it! Thanks for the motivation! So you bake it right after shaping? No second rise after it’s in the pan? It looks delicious! Sorry about that, forgot to mention a second rise in the instructions! A second rise probably isn’t necessary but you can allow it to rise for an additional 30 minutes or until nearly doubled. It will continue to expand in the oven so you shouldn’t let it rise too much before putting it in the oven. Love this gorgeous soft ‘n fluffy loaf, Rachel! It’s just begging to be slathered with butter or jam… or turned into French toast! The “big” winter storm came and went. It produced a lot of snow, but it wasn’t the beast they claimed it to be. I’ll take two slices slathered with extra butter. Pinned. I wanna stick this in my toaster and get out some spreads! I love Potato Bread and it looks like you nailed it. 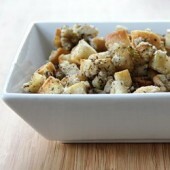 I like the idea of incorporating Parm cheese, never tried that before with Potato Bread. Btw, that first pic is driving me mad…I’m fantasizing about smothering it in butter! Thanks for sharing the recipe. Thanks so much Trevor. Potato bread and rolls really can’t be beat! Rachel…don’t mean to ask a silly question but what kind of parmesan did you use? Fresh wedge you grated or the shaky can kind that is drier and fine? Bread looks great, looking forward to a weekend so I will have time to make it! 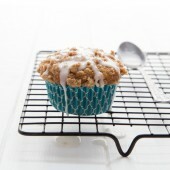 For this recipe I used the powdered shaker variety, simply because it’s more convenient and cost friendly. :) Enjoy! 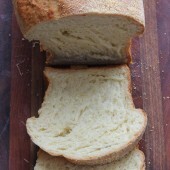 Thanks Rachel..can hardly wait to slop some butter on this beautiful bread! !